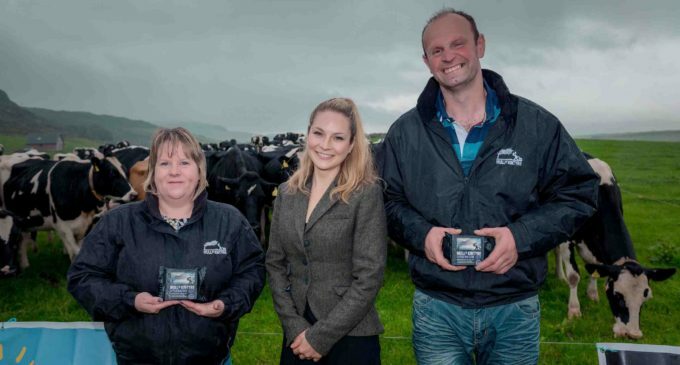 Scottish dairy and egg producers across the country expect to see business growth thanks to a raft of new listings with CIS Excellence Awards sponsor, Bidfood Scotland. Launching its range of Scottish dairy products and free-range eggs for the foodservice sector later this month, the company will supply products across 35 lines from 10 local suppliers including a farmer-run dairy and family farm. The range, which took Bidfood Scotland six months to put together, will serve 5,000 customers across hotels, restaurants, cafes, care homes, healthcare and education in Scotland and will allow customers to source more of their everyday products from local suppliers. Bidfood Scotland’s Business Development Manager, Katie Sillars (pictured centre with Linda and James Mclean, milk producers for First Milk, Mull of Kintyre and Campbeltown cheddars), says the business is offering opportunities to grow into what is often a new part of the hospitality sector: ‘Our strategy is to find the right balance between quality and value for money and our aim is to work in partnership with our suppliers to help them drive growth in the dairy and egg categories around Scotland, as well as across the whole of our UK business,’ she said. The development of Bidfood’s new dairy and eggs ranges is part of the company’s support of Scotland Food and Drinks’ new Ambition 2030, which works in partnership with the Scottish Government and the Scottish Dairy Hub to double turnover in the Scottish food and drink sector to reach £30bn by 2030.